Now in its the third year, the Adrenaline Circuit Race slightly changed it’s course from previous years with a slightly longer course. The riders gave it two thumbs up and said that they enjoyed the course from the previous version. The course was held on the outskirts of Chula Vista next to the U.S. / Mexico Border. Chula Vista has been growing exponentially, so having a race to introduce the community to cycling was great to see. The weather was in the mid 80s and the course had great pavement along with plenty of climbing over the duration of the 50 mile race. The Adrenaline Circuit Race also hosted the Junior Road Race State Championships that included racing categories in the Junior 9-10, Junior 11-12, Junior 13-14, Junior 15-16 and Junior 17-18 for both Junior Men and Women. It was a great day of racing as the Junior categories battled it out for a chance to claim the Title and Championship Jersey. In the Women’s 1-3 race, Esther Walker (SDBC / Emerald Textiles) took the win in a field sprint ahead of Pam Schuster (Monster Media) and Shannon Castle (Holliday Rock pb / Zoca) to round out the top 3 podium spots. The Pro 1/2 race started out with 50 plus riders and each team seemed to have a couple of riders or more per team. So teamwork would be a factor in controlling the field. The riders chilled on the first lap to see what the new course would be like. However, once we got into the other laps they started to launch the attacks to get things going. The attacks seemed to stick out there for a lap or two, then the pack would reshuffle and another batch of guys would go for it. 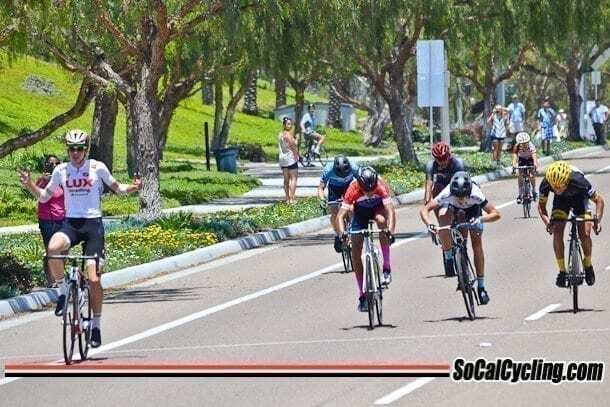 By mid race, Tyler Locke (Centric Race Team), Logan Bass (SDBC), Randall Coxworth (Monster Media), David Santos (KHS Maxxis), Rob Alvarez (Stone House Group p/b Pro Bike) opened a mid-race gap of almost a minute, then a few laps later a chase group formed. Enrique Aldapa started the chase which included Quinten Kirby (SoCalCycling.com Team), Thurlow Rogers (Amgen Masters), Chris DeMarchi (Monster Media) and Wouter Zwart (Stone House Group p/b Pro Bike). The pack seemed content on letting these two five man groups chase each other down. With the race coming down to the last couple of laps the break was really working well until the last lap and the chase group was able to close within about 15 seconds of catching them. But to no avail, and the lead five riders would be sprinting it out or attacking each other on the final climb and it turned out that Logan Bass and Tyler Locke attacked near the bottom of the climb and was able to hold off the charge from the three remaining breakaway riders. With Tyler Locke (Centric Race Team) taking the win ahead of Logan Bass holding on for second and Randall Coxworth sprinting ahead of David Santos and Rob Alvarez. The Adrenaline Circuit Race had a great course! For an out and back race, it was actually very fun to do!